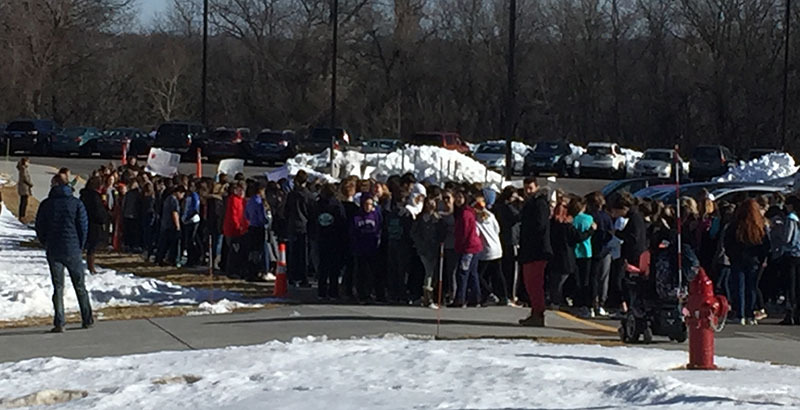 Even after months of bitter discord over free speech rights, students in suburban Minneapolis enjoyed 17 minutes of peaceful — if carefully managed — Parkland protest. “I don’t want to take a bullet for my education.” Students walk out for Parkland observance in a solidly purple heartland suburb. Edina, Minnesota, has been ground zero for ugly disputes about student and teacher free speech. But Wednesday’s Parkland walkout wasn’t one of them. 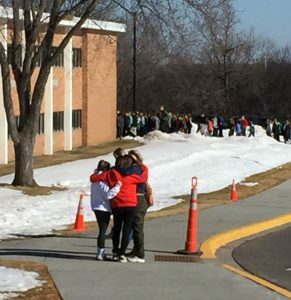 Against a welcome backdrop of brilliant sunshine, students at Edina High School and the adjacent Valley View Middle School poured into the part of the parking lot usually reserved for school buses. Orange traffic cones delineated a designated space for the student-planned vigil, and teachers and school administrators rimmed the perimeter. “I don’t want to take a bullet for my education,” read one sign held aloft. “I call BS on the NRA,” proclaimed another. Located in an affluent, leafy and solidly purple suburb of Minneapolis, Edina has lived through several recent controversies involving free speech. Adults and students alike have taken bitter complaints about the airing of viewpoints they oppose to the Capitol, the statehouse, and national news media, calling for restraints on youth and educator expression. It’s a community divided. But the Parkland observance outside the school was entirely peaceful. And very carefully managed. Police cruisers blocked the entrances to school parking lots in different parts of the small district and were stationed on side streets and in front of school buildings. District officials came out to make sure news media stayed on public sidewalks. Students who remained on campus and respected the parameters would not face discipline, district leaders said. Those who chose not to participate were expected to remain in class. On March 1, the district settled a federal lawsuit brought by the families of five members of the high school’s Young Conservatives Club (YCC) who claimed their group was effectively and wrongfully disbanded by school leaders following a social media dustup in the fall. After several students took a knee or sat during the national anthem at a Veterans Day ceremony at the high school, members of the club posted a video online, accompanied by anti-immigrant slurs. Anonymous student “anti-fascists” fired back with crude taunts of their own. School officials asked YCC leaders to delete the online site where members’ remarks were posted. By doing so, the campus conservatives and their parents contended in court records, the school effectively disbanded the club. Further, requiring student speech to “respect” the Veterans Day protesters violated club members’ First Amendment rights, the suit charged. Though district leaders say the settlement does not change in-school practices, Edina students were among those who testified in recent days at the Minnesota Senate in favor of a bill that would require “academic balance” in schools. “Public education courses are not for the purpose of political, ideological, religious, or antireligious indoctrination,” according to the bill, which advanced to the Senate Education Finance Committee March 8. 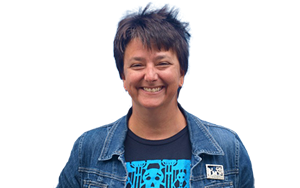 Though the bill, if it continues to advance, faces certain veto from Minnesota’s Democratic-Farmer-Labor Party governor, the YCC has claimed its introduction as a victory. The drafting of the legislation follows a months-long controversy in which a longtime conservative political commentator, Katherine Kersten, wrote a polemic charging that classroom discussion of race and white privilege was ruining academics in the district. Another Kersten analysis, “No Thug Left Behind,” turned up in social media decrying the national walkouts Wednesday. No such controversy was on display outside Edina schools Wednesday morning. While students chanted, “Respect the 17!” the driver of a passing Range Rover tooted the car’s horn in solidarity. Up the block, a group of mothers wearing T-shirts from various gun control advocacy campaigns declined to give their names, saying they wanted the day to be about the students. They were there, they added, to make sure their kids knew adults had their backs — and they were staying more or less out of sight because the teenagers were easily embarrassed. At exactly 10:17, teachers propped open the doors to the schools and students began filing back in. Four young women lingered in the all-but-empty parking lot for a few more minutes in a group embrace, their heads cast down and their teachers at a respectful distance. By 10:25, the students were indoors and presumably returning to class.